A tent is quite possibly the most critical piece of gear for campers in any situation. There are a lot of standard tents out there, but if you’re looking for a cool, unique camping tent, you might be in luck. Many tent manufacturers have began to push the envelope and create tents that are unique, yet still functional in the outdoors. We’ve researched a variety of options and have picked some cool tents that not only look great, but can function as a camping tent in the outdoors… even if your idea of the outdoors is your backyard. Coleman is the most traditional of all the tent manufacturers. It makes sense as it is one of the oldest outdoor companies around. While it usually sticks to the standard camping tent, the company’s Pop Up Tent is becoming a favorite for campers looking for a no hassle camping experience. This tent is an excellent car camping tent for campers looking to setup quickly and should be a top pick especially if you’re looking for an occasional car camping or family camping tent. The tent is a great option for campers who only camp occasionally in nicer weather. 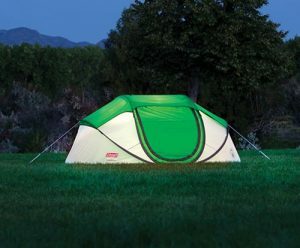 The Pop-Up Tent is a three season, free standing, dome style tent that includes: Taped floor seams that keep you dry even on soaked ground. A multi-position rainfly that ventilates and protects from bad weather. Pre-assembled poles for easy 10-second setup. The tent packs up flat for easy storage and has storage pockets to organize your gear. 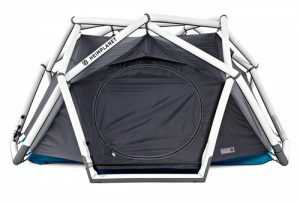 Additional features that Heimplanet tents includes are: Inflate in less than one minute using any standard pump. 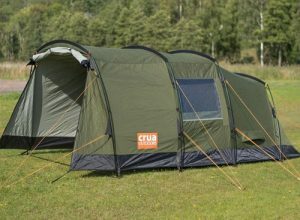 The Frame, inner tent and outer tent work as a unit and only need to be assembled on the very first setup. Great for expeditions, backpacking, or car camping. Superior stability: The geodesic structure can withstand strong winds and is a favored design for expeditions. Multi-chamber safety system: Individual inflatable chambers are separated by valves. Even if part of the structure deflates, the tent will not collapse. Tent tubes are easily repaired in the field. Waterproof double-layer tent structure: 2-wall structure ensures little condensation. The star-shaped roof forms a point-symmetrical slope that offers five run-offs for rain and no water buildup. 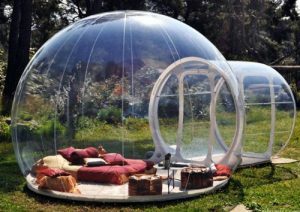 The Inflatable Bubble Camping Tent has become very popular recently for those looking to expand their home into the outdoors. This is not a tent you take away on a camping trip. 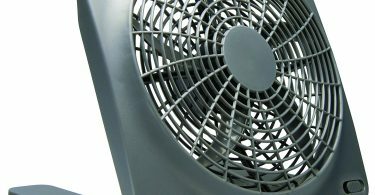 It is more of a structure you setup in your backyard to offer some extra outdoor space. Tree tents are hanging camping tents that are suspended above the ground. 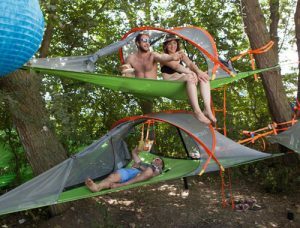 Tree tents and even hammock tents are becoming increasingly popular among campers looking to do the following: stay above the ground to avoid critters, camp anywhere they like and not worry about rocks, uneven ground, or camping above or near water, get a good night sleep if they are uncomfortable on the ground. The Tentsile Connect Hanging Tree House Tent is different than a hammock in many ways but what we found most different is the weight and amount of equipment the tree tent needs. Hammock tents are a pretty good option for backpackers, but we think the weight of the extra straps and clamps make the Tentsile Connect more conducive to car camping, family camping, or canoe and kayak camping where you’re not carrying around weight on your back for extended periods of time. In addition, setup takes a little bit of extra time so it’s best if you setup once and leave the tent setup for at least a few days. The Tentsile Connect Tree Tent features an adjustable double hammock bed with 2 large pockets on each side, full no-see-um mesh top with four fold away doors and a removable rain fly for unbeatable views. The rain fly can be pegged out towards the ground, creating a large 120ft² / 9m² covered porch area and multi-story camping base. It can be suspended between three strong anchors such as trucks or boulders. While rugged looking, the CRUA Tri Insulated Camping Tent is designed to provide the best night’s sleep in any condition. The tent is actually a glamping tent when you consider exactly how spacious, comfortable, and functional the tent really is.